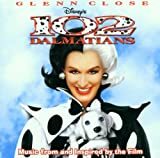 Accueil Produits Bande originale La bande originale de “102 dalmatiens”. La bande originale de “102 dalmatiens”. Sortie : 6 novembre 1999. Cet album comprend des chansons inspirées du film. 1. Digga Digga Dog (par Oren Waters) – 3:27. 2. Cruella (par Susanne Blakeslee) – 2:49. 3. What Can a Bird Do ? (par Jeff Bennett) – 3:04. 4. The Language of Dogs (par Randy Crenshaw) – 2:51. 5. I’m Gettin’ Good at Being Bad (par Susanne Blakeslee) – 3:35. 6. Puppy Love – 2:05. 7. Cruella de Vil 2000 (par Mark Campbell / Camara Kambon) – 3:19. 8. My Spot in the World (par Lauren Christy) – 2:37. 9. Bella Notte – 3:25. 10. So Fabulous, So Fierce (Freak Out) (par Jocelyn Enriquez / Thunderpuss) – 3:02. 11. Whatcha Gonna Do (With Your Second Chance) (par Nobody’s Angel) – 3:06.